I am happy that I found my lost apples, from a couple of post ago. For one thing the apples were to the point that I had to bake something with them or in a couple of days they would have gone bad. For the main reason I really really wanted to bake the apple coffee cake recipe that I had found. 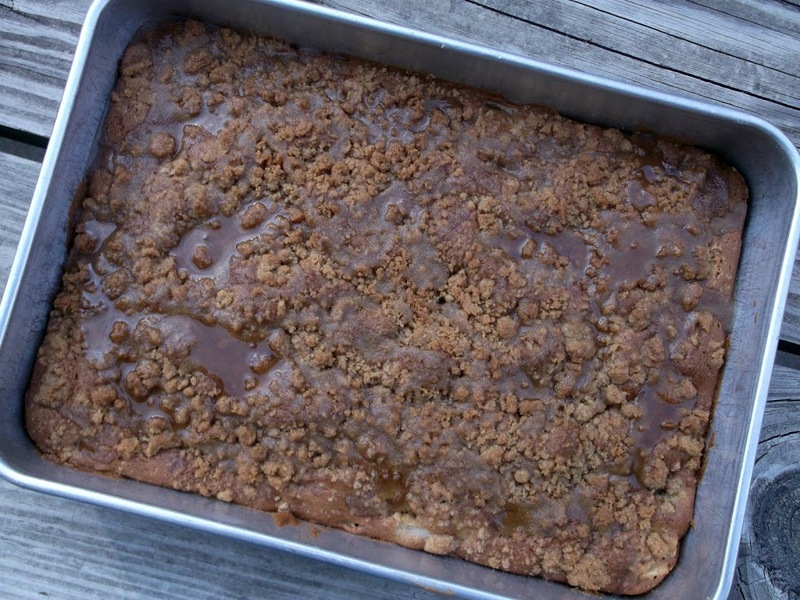 Just the name of this coffee cake – apple coffee cake with crumble topping and brown sugar glaze had my mouth watering. Apples, cinnamon, brown sugar, along with a crumble topping and brown sugar glaze, can’t really get much better than this. The coffee cake is seriously moist and it gets more moist as the days go on after it is baked, if it last that long. As soon as the coffee cake cooled a little after being baked we were cutting pieces of it to sample. 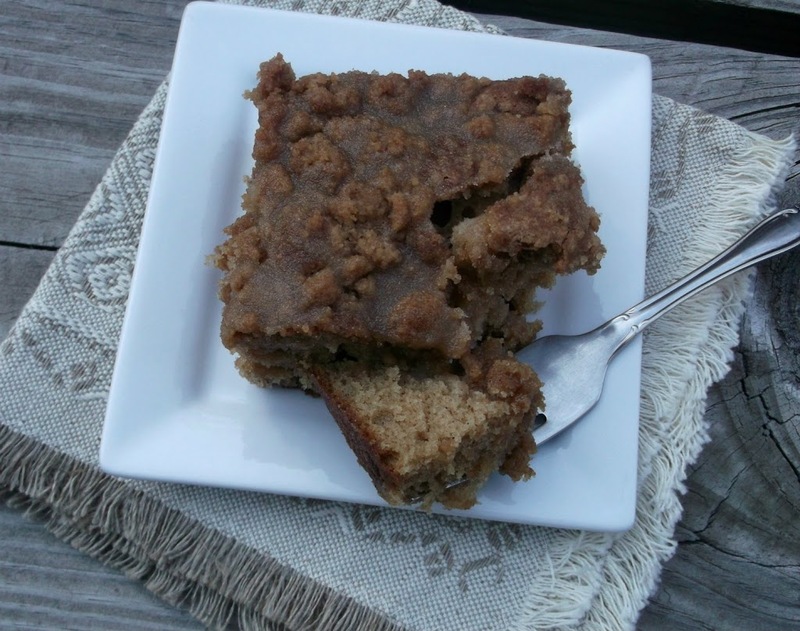 This coffee cake lives up to its name, totally delicious!! 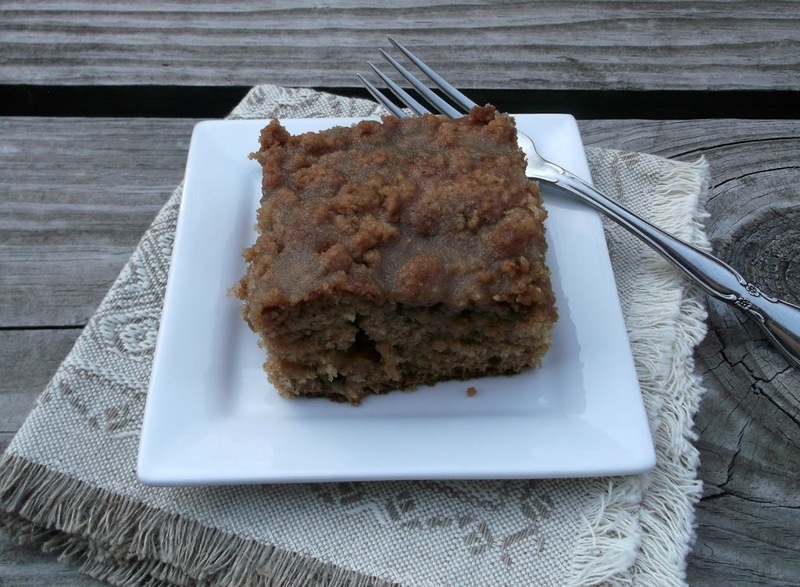 I know the recipe calls it a coffee cake, but I think that it would be wonderful to top it with a little sweetened whip cream and served as a dessert for lunch or dinner. When it comes down to it, it doesn’t matter what time of the day that you serve this coffee cake; everyone will be gobbling it up. Preheat the oven to 350 degrees F. Lightly grease a 13 by 9 inch baking dish with 2 teaspoon butter. In a large bowl, cream together the remaining stick of butter and sugars until light and fluffy. Add the eggs 1 at a time, beating after the addition of each. In a separate bowl, sift together the flour, baking soda, cinnamon, and salt. Add to the wet ingredients, alternating with the sour cream and vanilla. Fold in the apples. Pour into the prepared baking dish, spread out to the edges. To make the glaze, in a bowl, combine the sugar, vanilla, and water until smooth. Drizzle the cake with the glaze and let harden slightly. Serve warm. Apples make a cake nice and moist…your coffee cake sounds very good. I would enjoy it any time of the day. I wish I had a slice with my coffee right now.